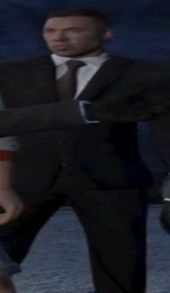 Karim Denz is a character in the HD Universe who appears as a minor character in Grand Theft Auto V. He is voiced by Matt Hopkins. Karim Denz is, in 2013, a getaway driver who Michael De Santa can hire for certain heists. The player can choose to use his services for eight percent of the heist's take. Denz has decent initial skills in terms of driving and composure; however, he has a poor initial vehicle choice ranking. If chosen, Karim Denz sources Pegassi Bati 801 sports bikes for the getaway, which perform poorly in the wet and muddy tunnels of the Los Santos Metro and the sewers. While raiding the cases, he has a chance of losing some of the jewelry. Also, he fails to give Franklin any directions in the crew's getaway, and if Norm Richards is chosen as the gunman, Denz loses his bearings in the tunnels, delaying the crew's getaway. If the player chooses the "Roof Approach" and selects Denz for the first time, he shows up late, forcing Michael, Franklin, and the chosen gunman to hold off more FIB agents and LSPD. He also shows up in a slow van, and due to the firefight, Michael or Franklin has to evade a four star wanted level, before returning to Franklin's house. If the player previously used Denz in the Jewel Store Job, he learns from his past mistake and shows up just in time in an Ambulance, allowing the crew to stealthily leave Downtown Los Santos; however, there is a chance of their cover being blown if the player chooses an inexperienced gunman. If the player chooses the "Loud Approach", Denz can either pilot the second helicopter or operate the locomotive. If Denz does not have experience from previous heists and is chosen as driver number one, Denz crashes his helicopter into one of the windmills of the RON Alternates Wind Farm, causing the crew to lose half of the take. If Denz has experience from at least one job, then he will not crash the helicopter. If Denz is chosen as driver number two, then he operates the train and there is no consequence regardless of his prior experience. If the player chooses the "Subtle Approach", Denz can either drive the fourth Gauntlet or be on the tire changing crew. If Denz does not have experience from previous heists and is chosen as driver number one, he crashes his car and is arrested by the LSPD, losing one quarter of the take. If Denz has experience from at least one job, then he will not crash his car. If Denz is chosen as driver number two, he changes the tires on the Securicars quickly regardless of his prior experience. This page was last modified on 28 December 2014, at 16:28.